Cascade may be a “new name” in the fitness business, but their team is not. With over 25 years of experience in the equipment industry, they are responsible for some of the very best products ever produced including the original award-winning LeMond indoor cycles. With this knowledge, it should come as no surprise that the CMXPro is a fantastic indoor ride. Its low maintenance magnetic resistance and precision balanced belt driven flywheel deliver a durable, quiet and silk-smooth road-feel feel while its narrow pedal spacing (aka Q Factor) and optimally vertical pin / micro fore / aft handlebar and seat adjustments make for a perfect riding position. 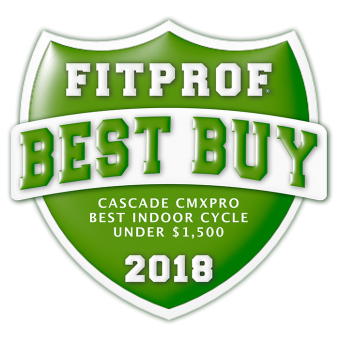 Add to that the heavy duty structure and great warranty, the Cascade CMXPro is one of the best indoor cycles on the market and the 2018 FIT PROF BEST BUY indoor cycle under $1,500!